I’ve writtern my football betting site reviews on the same page so you can scroll between each for easy comparison, as opposed to browsing from page to page causing you to forget about the details. Quickly compare bonuses, deposit methods, withdrawal or payout times as well as background information about each Canadian-friendly football betting site for players in Canada. Bodog is one of the oldest names in the sportsbook business, established in 1994. Bodog.ca is specially targeted to the Canadian market so they know what we like to wager on and how we like to do it. 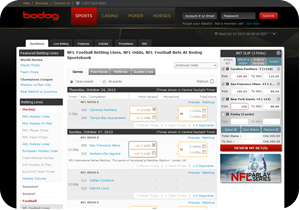 Bodog specialises in football props with an extensive list surrounding both the game results and player performance. Can you trust Bodog? Bodog has never missed a payment and has paid out over $50 billion in winning bets over 19+ years. Can you get help when you need it? Bodog's customer service team works 24/7/365 so you can always talk to a real person. Is my information secure? 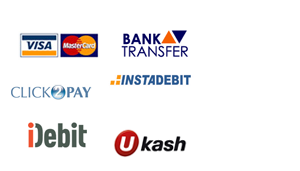 Bodog has a 100% security record and have never been hacked so your balance and funding source is secure. 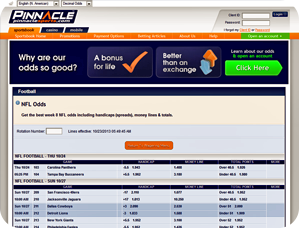 Pinnacle Sports was established in 1998 and is known for consistently high paying odds. Can you trust Pinnacle? Pinnacle is fully licensed to conduct online gaming operations by the Government of Curacao. The Southern Caribbean island of Curacao is one of the oldest, and most politically stable providers of regulated egaming services, serving some of the most highly regarded egaming organizations since 1996. The license covers games of chance and sports betting. Pinnacle now serves customers in over 100 countries. Sports Interaction (SIA) has been in business since 1997. 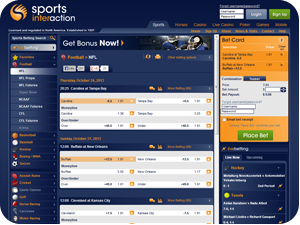 In my opinion and it is only opinion, I believe Sports Interaction has the simplest betting interface, allowing you to navigate through the sports and bet-types easily so you can place your bets easily. Can you trust SIA? SIA is both located and regulated in Canada by the Kahnawake Gaming Commission which is a Mohawk territory just outside of Montreal. Can you get help when you need it? Sports Interaction's Canadian customer service group works 24/7/365 so you can always talk or chat online to a real person. Is my information secure? SIA uses some of the most advanced security techniques available. SIA uses a Verisign Secure Socket Layer (SSL) encryption. SSL is a protocol for secure communication over the internet. Being Verisign secured ensures all customer transactions with them are encrypted to the very highest security levels. Verisign is the Certificate Authority for forty of the world’s largest banks and 95% of Fortune 500 companies. William Hill has was founded in 1934, making them one of the oldest names in international sportsbook companies in the world. For the most part, they avoid advertising a lot so you won’t see them on TV. They are however the lead sportsbook sponsor for the English Football Association also known as the FA. Can you trust William Hill? The corporation is headquartered in London, England. The company is registered in Gibraltar, licensed by the Government of Gibraltar and regulated by the Gibraltar Gambling Commissioner. The company is registered in Gibraltar for tax purposes, as Gibraltar is a haven for sports betting and online gaming companies as UK tax laws are far more punitive. Can you get help when you need it? William Hill customer service team is available 24/7/365 so you can always talk or chat online to a real person based in the UK. Is my information secure? 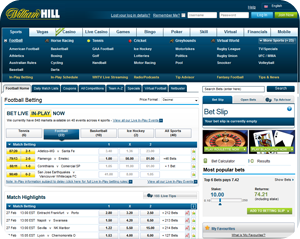 The William Hill site uses Thawte SSL web server certificates to offer secure communications by encrypting all data to and from the site. Thawte is now owned by security software company, Symantec.